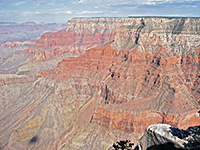 Although the paved West Rim Drive ends at Hermit's Rest, several forest tracks follow close to the rim for 20 miles further west, from where other overlooks can be reached by cross-country hiking - most easily Mimbreno, Mescalero, Jicarilla and Piute points, though the main track (which starts 1.5 miles south of Grand Canyon Village) is rather rough, and all of this area is very remote. But the next two points west of Pima (Yuma and Cocopa) are reachable on a day hike starting from Hermit's Rest, so this first involves a ride on the shuttlebus, taking nearly an hour. At road's end, a short walk leads to the trailhead for the Boucher and Hermit routes into the canyon. From here, after quite a steep descent of 1,200 feet, the path passes a junction on the left (Waldron Trail) and on the right (Hermit Trail), then curves around the two upper forks of Hermit Creek to a third junction. Taking the left fork, the path climbs a little to Dripping Spring, a small water source beneath an overhanging pour-off in a side canyon. The spring is 3.1 miles from Hermit's Rest and is the usual destination for hikes on this trail, but the path continues, now much less used - round the far side of the canyon then back west, above the pour-off and along the overgrown streambed for a while before turning back south, up to the rim and joining a forest road. To reach Yuma Point one must leave the path just before it begins the climb from the streambed, and head north, through prickly bushes and up a steep, bouldery side ravine then along the drainage above to the top of Eremita Mesa - a flat, wooded plateau with no landmarks to aid navigation, though walking becomes quite easy. 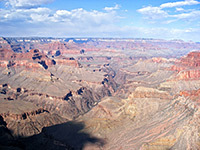 The viewpoint is now a one mile walk away through the trees, and offers quite spectacular views over the Colorado gorge. The river is just two miles distant, closer than at any other point to the east. This remote, peaceful spot is only spoilt at times by the near constant noise of sight-seeing helicopters and planes, this being within the zone where such flights are permitted. 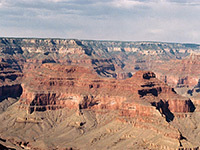 To the west, Yuma Point looks out over Hermit Creek, Cope Butte beneath Pima Point, The Alligator beneath Mohave Point, and, in the distance, eastwards as far as Cape Royal on the North Rim. 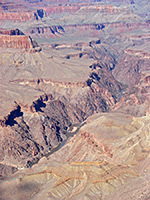 Several miles of the Colorado River can be seen east and west, including three sets of rapids (Boucher, Granite, Salt Creek). 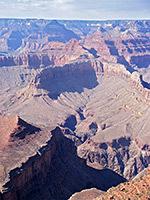 Many famous buttes on the North Rim are in full view as are numerous canyons and peaks to the northeast, all the way to the Grand Scenic Divide and Powell Plateau. The round trip from Hermit's Rest to Dripping Spring and Yuma Point involves a total ascent of 3,000 feet and a distance of 12 miles, of which 4 miles is off trail, so it is not particularly easy. The hike takes at least 7.5 hours.